There is a secret shared by all great entertainers -- and Alfred Hitchcock knew it: give a show everything you’ve got and you can always trust your audience to love you in return. Thus, behind Hitch's carefully-constructed persona marked by bemused British detachment lay a penchant for self-revelatory storytelling. As I said in my November 27 post, such candor draws me to him. The biographical details that he carefully tucked into his 1946 Notorious tell a story of the ugly things men sometimes do when they fall in love. The title card above ("Alfred Hitchcock's Notorious") reveals more than the director's authority in the movie. The possessory credit tells us that this is Alfred Hitchcock's story -- and it belongs to no one else. T. R. Devlin, played by Cary Grant, is a seemingly cold-headed FBI agent who hides his romantic feelings for Alicia Huberman (Ingrid Bergman) as he prompts her to accept an assignment to play a role as a double agent. Placing her in the home of Nazi agent Alexander Sebastian (Claude Rains), he helps coach her to play her role so convincingly that Alexander falls for her and proposes marriage. Soon enough, however, Alexander suspects Alicia of unfaithfulness and discovers her real identity. He decides to solve the problem with a modicum of arsenic and Devlin arrives in the nick of time to save her from certain death. Like a film director, Devlin coaxes a performance out of his leading lady – using whatever tools at his disposal in order to elicit her best performance. 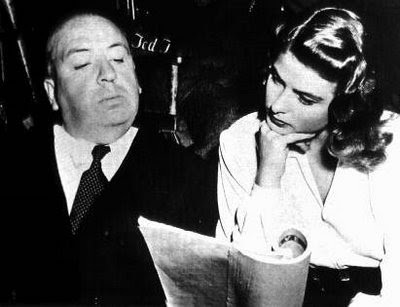 Thus, Notorious can be seen as Hitchcock’s rumination on what it is like to be a filmmaker who falls for his leading lady. What emerges is a candid self-portrait of a ruthless man wracked with pain and longing. Devlin gathers with a team of FBI agents to work out a plan that puts Alicia's life in peril in order to infiltrate the enemy. The scene has the casual look and tone of a script conference -- specifically the amicable conferences that Hitch and screenwriter Ben Hecht enjoyed while developing Notorious. This would merely be an academic exercise if it weren’t for the fact that Hitchcock himself had become infatuated with Bergman. Yet he allowed Bergman’s husband, Life magazine photographer Robert Capa, on the set to take still photos of the production. Watching the two must have been exquisitely painful for him. Not unlike Devlin, who watched helplessly as Alicia bedded down with Alexander. Though I couldn't find any credits, it seems likely that Bergman's husband Robert Capa took this photo on the set of Notorious. Like Grant, Hitchcock had to bite his tongue while directing the beautiful Bergman to utter words of love in another man’s arms. In the movie, such a predicament torments Devlin who imagines that Alicia is actually the boozy tramp that he had once accused her of being. Unable to bear the situation any more, Devlin decides to leave the assignment in Brazil and move on to another job in Spain. Hitchcock himself might have felt so tortured as to want to leave the film and the country. Of course, he couldn’t admit to his amorous feelings. For one thing, he was married (and so was Bergman). For another, he had a hard time warming up to women. And so, when Devlin tells Alicia, "I've always been scared of women, but I'll get over it," we can take that to be an admission from Hitchcock himself. Not many men would admit to being afraid of women. Such vulnerability is all too rare. But, through his films, Hitchcock admitted to all kinds of fragilities. No wonder he was so guarded in interviews regarding the psychological meaning behind his films. Such sleight-of-hand was the only protection he had. More on this later. Your reading of Notorious makes this already near perfect film more touching--I've always found this film to be on an equal footing to Vertigo when it comes to stirring deep emotions. I cannot watch either film without being overwhelmed emotionally. Isn't that the truth! Hitch shows such deep feeling and compassion in these films -- yet it's so often overlooked. Actually, Bergman was married at the time to Dr. Peter Lindstrom, though it's correct that she and Capa were in love.